At the airport lounge in Amsterdam, waiting to be checked-in for my flight to Tallinn, Estonia, I thought, this is exactly the right place and time to reflect on my musical year. I think I have to start from the most recent news. 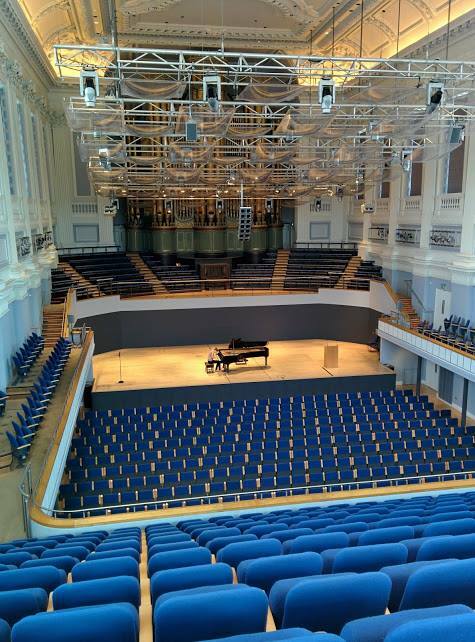 On the 4th of July I played at the Birmingham Town Hall at the final of the Amy Brant International Piano competition – and WON it! I cannot describe how happy I am. I always try to play my best, but I never expect to win, so receiving 1st prize as well as the audience prize (!!!) was my personal little triumph. To know, that there is an audience, that sincerely enjoyed your performance…it is indescribable happiness. I am extremely grateful for everything, that happened to me this year: to all the music I have played and to all the people, that I have played this MUSIC with. I wish I could write more, but my battery is low and the boarding has started. I shall share a little picture of my rehearsal at the Birmingham Town Hall, taken from the highest possible point. My destination: Tallinn and then St. Petersburg in just 24 hours!